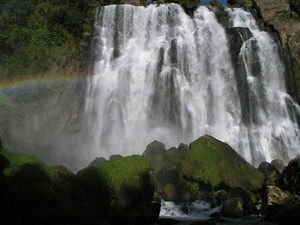 Water resources seem inexhaustible in New Zealand as the Marokopa Falls is often described as the most beautiful and fascinating natural phenomena. Marokopa Falls is located very close to Waitomo Caves which are unique in nature. The cave is illuminated with types worms, which give the feeling of the starred night sky. Marokopa Falls is an amazing picture - the sun's rays fall directly on the often turbulent falling waters, resulting in a beautiful view. Marokopa regularly is complemented by the picturesque forms of small or large arcs. The early natural landmark, Marokopa, starts at 36 meters from the lower basin, which accounts for pure water. Marokopa is quite a wide and rocky waterfall. At its base is built a special platform for surveillance for its visitors, which reveals the beautiful views and allows the deafening noise to invade the ears. From the top of Marokopa, a magnificent view is revealed, but there the transition is very complicated and often impossible for tourists. The tourist path which leads to the viewing platform of the waterfall Marokopa gives an opportunity to explore fascinating places around the natural water phenomena. It is possible to extend to the very bottom of the waterfall Marokopa, but the path that leads there is permanently wet, muddy and slippery, sometimes even dangerous. Access to the waterfall itself is extremely easy. There is an option to park your car at a specially built car park, then a ten minute, pleasant and easy trail takes you to the incredibly beautiful cascades of Marokopa. Many believe that Marokopa Falls seems out of the fairy tales, when you see it, it gives the feeling that you have previously read about it in a book. From the Marokopa Falls you can get to the caves. Along the way you can stop and admire another landmark - Natural Bridge Mangapohue. This is an interesting stone arch formed by the remnants of a cave, the rock for which over time turns to a form that resembles a bridge, not a cave. If you look good on the surface of this landmark near Marokopa Falls you can see remnants of ancient fossils and marine life on them.